Golden Pico de Gallo is almost too pretty to eat. Definitely food art. I love any recipe that has lots of colors to tantalize the eyes and the taste buds. The yellow tomatoes and golden colored bell peppers are plentiful in the grocery stores right now. Plus, they are fun to use. The cucumbers and red onion add a fresh, crisp taste. Serve it up with those fun bean chips (like Beanitos) for a tasty, visual contrast. Can you tell? I eat with my eyes. 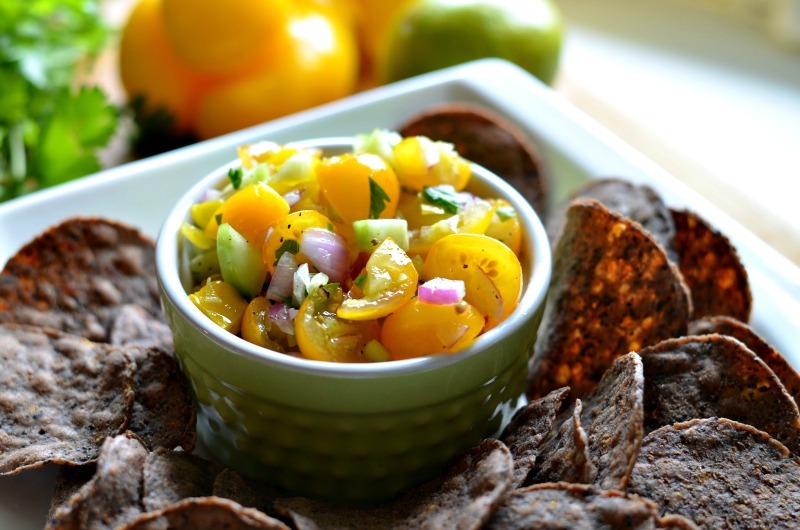 Golden Pico de Gallo is my new “go-to”summer appetizer. Super easy to make. Invite me to your party and this is what I will bring. It goes pretty quick so make sure you double the recipe. Trust me. Combine all ingredients and chill before serving. Serve with blue corn or Beanitos tortilla chips. All your recommendations are scrumptious- really enjoyed the roasted pepper and tomato soup!! !